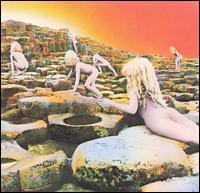 Houses of the Holy is the fifth album by English rock band Led Zeppelin, released by Atlantic Records on 28 March 1973. The album title is a dedication by the band to their fans who appeared at venues they dubbed "Houses of the Holy." It was the first Led Zeppelin album to not be, at least unofficially, titled after the band. The album represents a musical turning point for Led Zeppelin, as they began to use more layering and production techniques in recording their songs. It is also the first of three albums to be completely original, the first four albums featuring at least one cover. The other two albums are Presence and In Through the Out Door.